EASY INSTALLATION, TOP QUALITY COMPONENTS, AND A PROFESSIONAL JOB WHEN COMPLETED. THE KIT INCLUDES COMPLETE INSTRUCTIONS, COLOR-CODED WIRING DIAGRAMS AND INCLUDES A FULL ONE YEAR NO QUIBBLE WARRANTY. QUICK AND EASY INSTALLATION, THE KIT INCLUDES ALL PARTS INCLUDING MOUNTING HARDWARE, COMPLETE INSTRUCTION SET, AND ILLUSTRATED DIAGRAMS. THERE IS NOTHING ELSE TO BUY FOR A COMPLETE PROFESSIONAL RE-FILTER JOB. Röhrenradio-Imitation AM FM Radio. Was für die Nostalgie-Fans Ist zwar Retro aber trotzdem auch schon wieder älter. In this auction you will receive one pre owned Vintage Marantz CR-1200 Super Scope Portable AM / FM Cassette Player Recorder Good overall working condition, the radio is fully functional and sounds amazing! Some scuffs and scratches from normal wear and tear. Comes with power cord. The battery terminal are rusted so I did not test this feature, but with a little sand paper and some TLC it would probably work. Radio measures about 12" X 4" X 8" Please feel free to contact me with any questions. Shipping time is one business day from purchase. I cannot ship to a PO box if you are using Fed Ex option ( If Available) . Please leave a home address. Please leave Positive Feedback once you receive the item and fully test. If there is an issue Please contact me before leaving negative feedback so we can resolve any issues. Very faithful reproductions of the original copies of the Epoch. / Size: 11 x 6 x 9 cm. N. 49 / DUCATI RR 1350 / ITALY 1953. NOSTALGIC RADIO / MINIATURE COLLECTION. 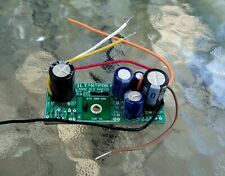 Battery-powered radio - AM / FM Circuit - Removable Antenna. NO SPECIAL SKILLS OR TOOLS REQUIRED TO DO A COMPLETE AND PROFESSIONAL INSTALLATION. HUNDREDS OF FILT-R-PAK UNITS ALREADY IN SERVICE WORLD-WIDE. NOTE: FILT-R-PAK PRODUCTS DO NOT CURRENTLY FIT THE OLDER 8G005 RADIOS WITH LOCKTAL TUBES. Stereo is in good and working condition. A replica radio from GE. This is model number 7-4100J 2907E and its design reflects the popularity of Art Deco style inthe period. It is in near perfect condition and looks and sounds great. The unit is in good working condition showing signs of use. There are scratches, marks, and scuffs on the radio. Tested and working. Excellent cosmetic condition. This is the best example of this model available on eBay at time of listing. Power light works. Tuner and tuner display work smoothly. AM and FM reception are excellent, even with the internal antenna. External speaker connection works. The only thing this needs is some contact cleaner as the knobs are noisy when turned and a bit touchy. Once in place though the unit sounds great. Nice, warm, balanced analog sound with a surprising amount of bass given the size of the unit. Walnut case with some light marring on top. Model SP 20B 2 channel (A&B) External Wireless Console Speaker with floor base and wall hanger. This is the large General Electric Porta Fi. Electronics look clean. Wood is nice, a couple nicks. The radio is in good working condition. The body appears to be in good condition with minor wear such as scuffs and scratches. It does have a small piece of the top left front that is broken off. Hi, this radio works " GREAT ". I heard people talking from all over the world. It plays quite loud. It runs on batteries or you can plug it in the wall. There seems to be one problem !! Panasonic FM/MW/MB/SW1/SW2CB Portable Receiver Model # RF-1150, Good Condition. Tested with 4 "D" batteries(not included) and included AC cord 110 volt. Gyro antenna is intact. Dial light works with the press of a button. No part is missing or broken, just used marks/scratches here and there. Alarm is loud and accurate. AM/FM radio works well. Housing intact with no cracks. Power cord intact. Tone switch works. Light works, needs new bulb. Wood grain on a black base. Clean lines. Works. Does need a cleaning. See photos for details. Thank you for looking. NORDMENDW Othello 55/3DR. Einmalig schön. Absolute beauty! Shipping world wide!! EM34 bei Dunkelheit noch gut / EM34 in darkness rather good. Gehäuse so gut wie makellos / Cabinet near mint. Hochtöner nicht original. Dadurch etwas dumpfer als normal / Tweeter not original. A little more dull sound than usual. Uhrenradio Elac Electroacustic RD100 220V 50Hz 10VA 159/22 #229494. Uhr funktioniert nicht / Clock does not work. Radio funktioniert / radio works. Shutter speeds are not tested. Verschlusszeiten sind ungeprüft. Condition is fair. Only tested ac and not dc. Tuner Lights Up. Model #ICF-9650W. Readers Digest Radio seems to be in good condition. Very good working condition. Matching serial #s.
Great working General Electric Super Radio II. Item works perfectly and sounds great. Item needs cleaned a little and is missing the top part of antennae. 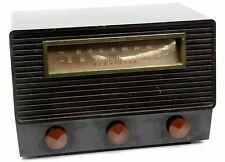 Very nice old radio. Free shipping anywhere in the US. Global shipping used for international buyers. Payment due within 3 days of purchase. Thank you for looking! Biete hier einen Volksempfänger VE 301 Sachsenwek. Radio brummt wenn man den Stecker in die Steckdose steckt..Sehr guter Zustand. Alles andere Siehe Fotos. Privatperson. Keine Garantie oder Rücknahme. SONY FM/SW/MW Portable Receiver Model # ICF-110W W/Protective Cover, Excellent. Tested with 3 "C" batteries(not included). Sound is loud and crisp. Antenna is complete, straight and smooth, no kink or bend. Dial light works with the press of a button. No crack or major scratch on the case, just light used marks. Enjoy your favorite radio stations. Quickly adjusts between AM or FM. Enjoy high-quality sound with retro style. Bring back the nostalgia without giving up modern conveniences like Bluetooth or AUX connectivity. Cool looking Retro TV. Tested in car and everything works. Of course I was not able to get any TV without a DTV converter but I did get snow. AM / FM both work. 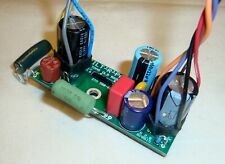 Panasonic FM/LW/MW/SW PLL Synthesized Receiver, Model No. RF-B40, Excellent. Panasonic FM/LW/MW/SW PLL Synthesized Receiver, Model No. 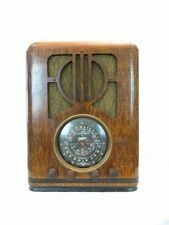 RF-B40, Excellent condition ,not scratches or dents,very clean.No batteries included.Check all pictures and ask questions before buying.Sold As-Is.No returns. The Fisher 100 featured five presets using the Tune-o-Matic feature was a. Here's a clean, working Panasonic radio. The wood and hardware are very nice. All the lights work and it sounds great. Vintage Panasonic Model RC-7053 FLIP CLOCK Radio Day Calendar WORKING! 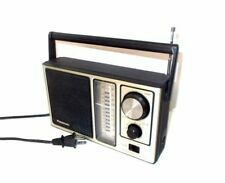 Up for Auction is a Restored Panasonic AM/FM Radio Flip Clock Model RC- 7053. It has been thoroughly cleaned inside and out. The Lights that illuminate the Clock have been replaced with the same type of bulb in GREEN. The clock keeps accurate time with automatic day indication. The plastic face has been polished but light scratches/blemishes may still exists. The radio is crisp and clear. The item pictured above is of the one you will receive. Now, although the item is restored and all functions working, because of the vintage nature of the item it is sold as-is and no return. Questions are welcomed. Thank you for looking and Good luck.